Contributed by Zel Allen. Kohlrabi, once the favored vegetable of European nobles and peasants alike, has fallen off the veggie pop charts. However, we predict a comeback for this neglected member of the Brassica oleracea family, more commonly called the cabbage family. Some people have mistakenly labeled kohlrabi a cross between a cabbage and a turnip. This is understandable, since both are members of the brassica family, but they are not of the same variety. We can only guess that other more pungently flavored vegetables like broccoli, cauliflower, and asparagus have simply upstaged kohlrabi, whose flavor is mild and delicately sweet, and its texture, crisp and moist. Though the flavor of kohlrabi is unassertive, delicate hints of cabbage and broccoli come to the foreground. Of kohlrabi’s two varieties, the purple globe is sweeter and tastier than the apple-green. Both have a pale green, almost ivory colored, flesh inside. 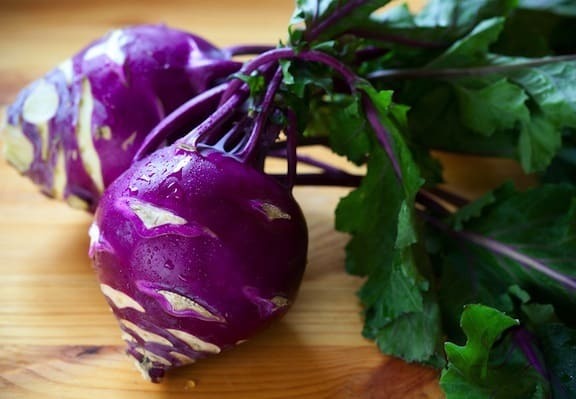 While the entire vegetable is edible raw or cooked, the small, young kohlrabi, about 1 1/2 to 2 inches (3.5 to 5 cm) in diameter, is ideal for its flavor and texture. 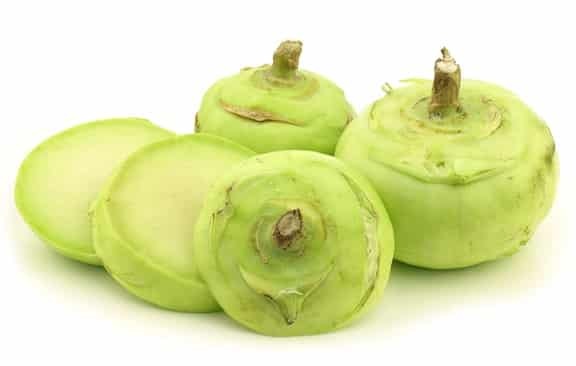 Shoppers should choose small kohlrabi with its edible skin rather than the giant size with its woody, fibrous texture and inedible outer layer. The larger globes definitely need to be peeled. Small kohlrabi no larger than 2 1/2 inches (6 cm) in diameter, with the greens still attached, are ideal. The greens should be deep green all over with no yellowing. 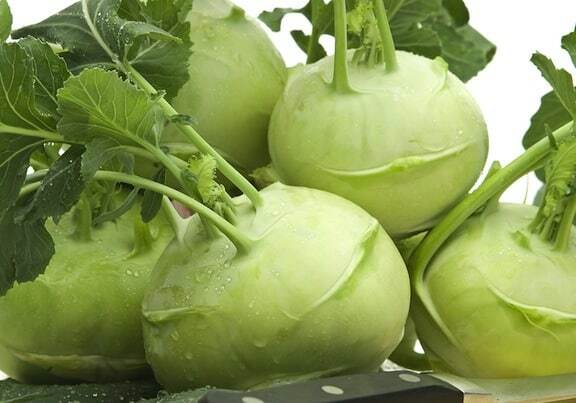 Although kohlrabi stores well, up to one month refrigerated, yellow leaves indicate that the vegetable is not fresh. Kohlrabi is available year round with its peak season and sweetest flavor in spring through early summer. Kohlrabi’s subtle flavor is best enjoyed in its raw state. Remove the stems by pulling or cutting them off the kohlrabi globe. Stems and leaves can be chopped and included in a tossed salad. Their flavor is mild and takes well to salad dressing. If the kohlrabi is small, there is no need to peel it, however, you may want to cut off the tough base end and any tough knots If you’ve purchased large kohlrabi, peel it and slice off the tough woody base before slicing or dicing. Slice or cut into julienne (narrow strips) and include on a relish tray with dips. Coarsely grate kohlrabi into a tossed salad. Because it is mild, succulent and porous, it absorbs the flavor of a mild or pungent salad dressing quite well. 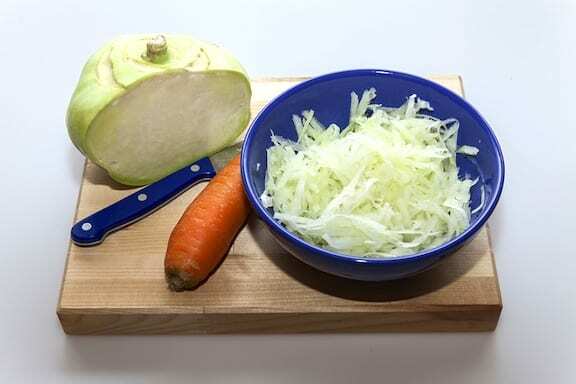 Grate kohlrabi and use in place of cabbage in coleslaw; good combined with carrot. Dice kohlrabi and combine with your favorite vegetables and dressing for a chopped salad with delightful crispness. Slice kohlrabi, wrap in plastic, and pack in your brown bag lunch for a crunchy snack. Chop and include as one of the ingredients in a raw soup, such as gazpacho, or as a garnish for a cold soup. Steamed: Slice kohlrabi or cut into bite-sized pieces and put into a saucepan with 1/2 inch (1 cm) of water. Add a dash of salt, cover and bring to a boil over high heat. Turn heat down to low and steam for 5 to 7 minutes. Leaves can be steamed lightly just as you would do spinach. Grilled: Slice or chop kohlrabi and toss in a bowl with a little extra virgin olive oil. Sprinkle with a dash of salt, and wrap in aluminum foil (shiny side inside). Place on the grill and cook for about 10 to 12 minutes. Stir-fried: Slice or chop into bite-size pieces and stir fry 5 to 7 minutes in a little extra virgin olive oil with a clove or two of minced garlic and a dash of salt. Visit Zel and Reuben Allen at Vegetarians in Paradise.